Come on into Ma Maison…..
Today, I am sharing my Favorite Room in the house, the Parlor, for Favorites on the First at The Polohouse. 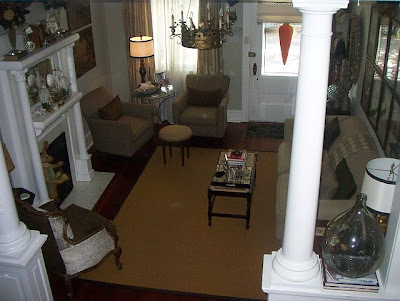 The Parlor as it is called in our home is what most consider the formal living room. J & I love to retreat to the serenity of the parlor for conversation (gossip) & cocktail hour(s). 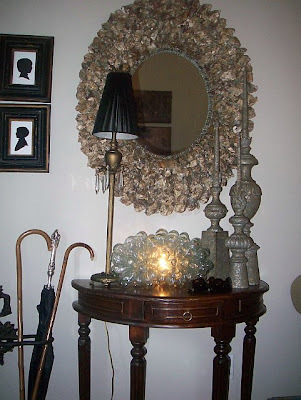 There is no “real” foyer in our home on Perrier, so I’ve created a welcoming vignette of a small demilune table topped with my favorite oyster encrusted mirror(www.wisteria.com) . The tabletop features a tall, skinny lamp, three decorative finials(www.aidangrayhome.com) , and a glass sculpture that I gifted J a couple Christmases ago (www.piednu.com) . 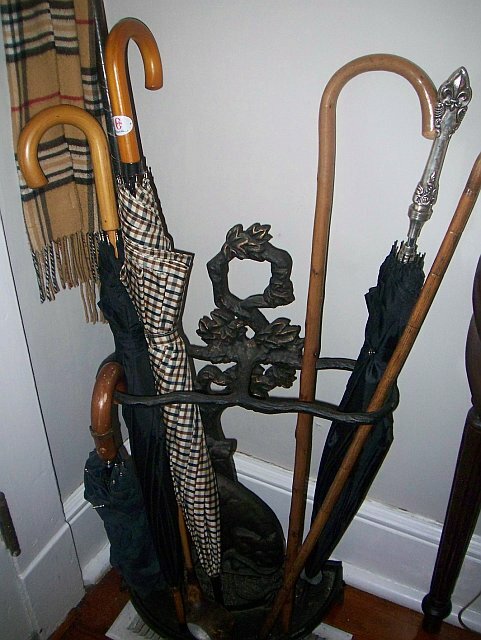 Behind the door is a metal umbrella stand filled with umbrellas, vintage canes, and even a vintage golf club I picked up from Scott’s Antique Market in Atlanta years ago. 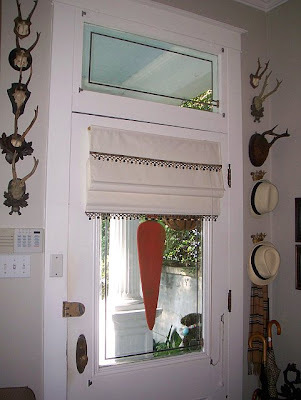 The door is surrounded by my collection of antler trophies, some vintage and some new. The Homeart crown hooks display a couple summer chapeaus and a Burberry scarf. Along the left side wall is a comfy light off-white herringbone tone on tone fabric sofa (www.intagliahome.com) complete with pillows---hounds tooth and a burlap lumbar neck roll. The Burberry-inspired blanket completes the look. 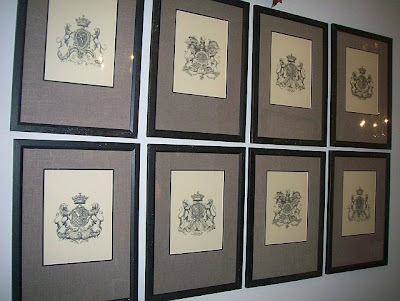 The artwork is a collection of vintage crests that J & I picked up on one of our jaunts to Amelia Island (http://www.facebook.com/theplantationshop) . I just love how the grouping fills the entire space. 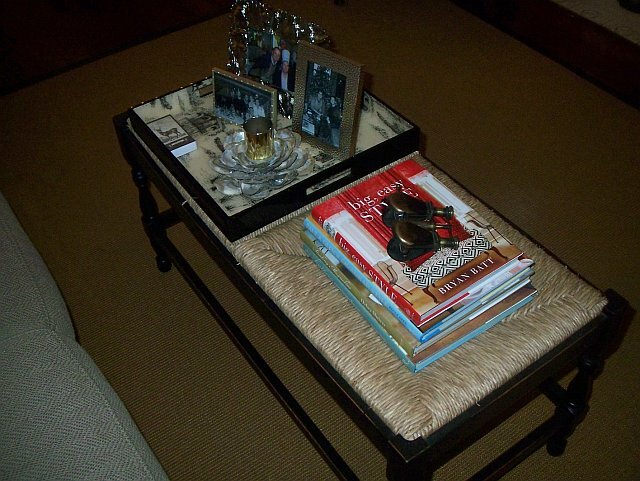 In front of the Rowe sofa is a rusch seat bench (www.ballarddesigns.com) that I love to use as a coffee table. The bench is topped with a square toile tray(www.hazelnutneworleans.com) filled with framed family pictures, dk clay oyster tray, and candle of the week. 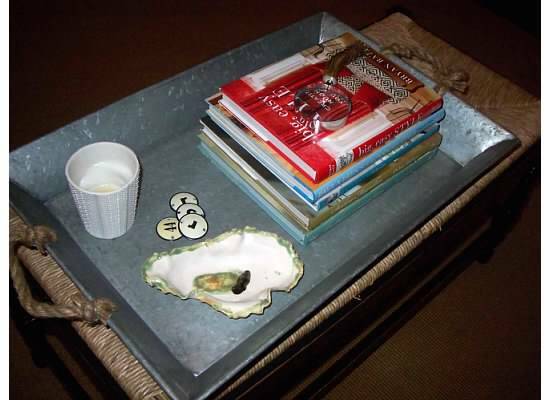 A stack of my favorite coffee table books completes the look--- Bryan Batt’s latest "big, easy Style", Paula Deen’s "Savannah Style", and Debra Shiver’s “Stealing Magnolias. 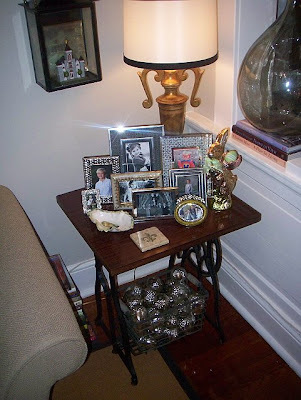 On the right side of the parlor sofa is an antique sewing machine base converted into a unique end table. 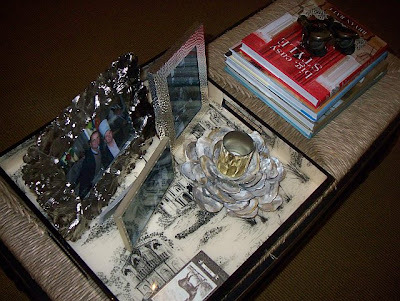 It is topped with a lamp, a collection of framed family photos, and an oyster dish. The coaster is marble. 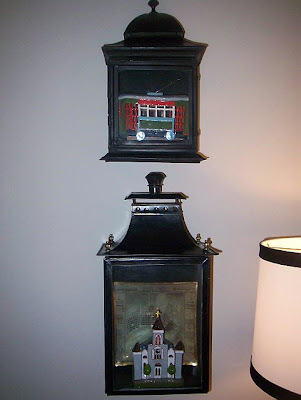 On top of this end table are two wall candle sconces which I use to hold some of my favorite New Orleans treasures, a ceramic model of a street car and St. Louis Cathedral. 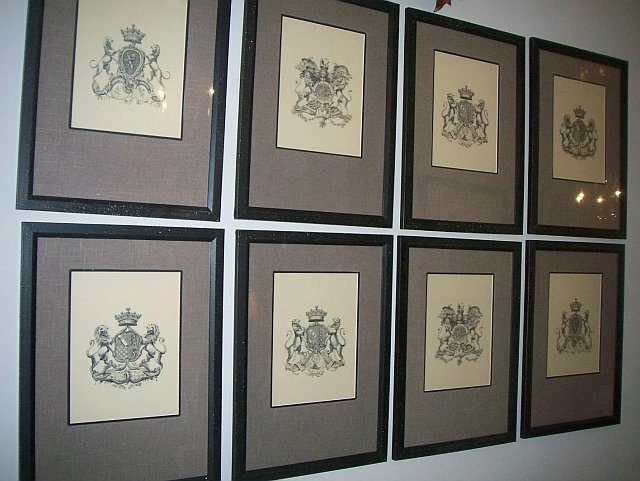 These were purchased at Hazelnut and are by Russian artists, Art Department. The niches feature two large clear demijohns found at an antique barn in Atlanta years ago atop stacks of my decorative books. 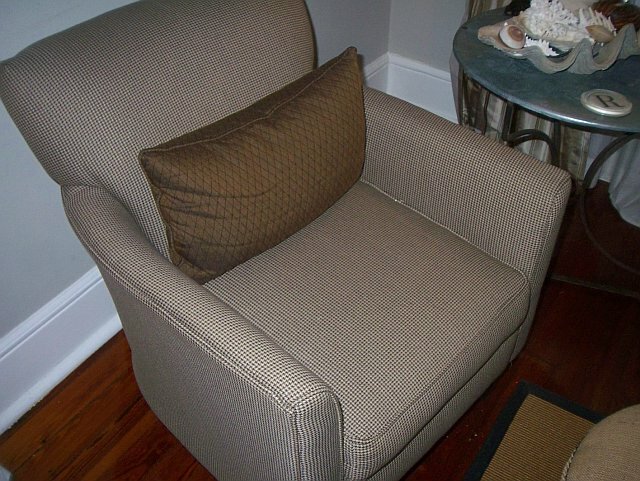 On the right side of the parlor one is greeted by two occasional chairs covered in a hounds tooth fabric and custom lumbar pillows(www.intagliahome.com) . I covered the ottoman also found at Scott’s in Atlanta in burlap fabric, used nail head detail trim, and painted out the based dark brown. In the middle of the chairs is a zinc topped Paris-style bistro table topped with a lamp, a large concrete clam shell filled with beach curiosities, more framed pictures, and three crystal orbs. 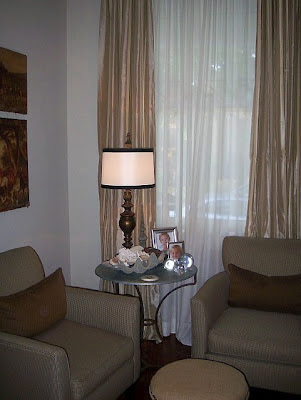 The 120” drapes are from Restoration Hardware (www.restorationhardware.com) . The parlor fireplace features more of my favorite coastal pieces-Lower mantle: two porcelain birds, two horn boxes(www.bdjeffries.com) , a fav shell(www.parismarket.com) ; Upper mantle: two dried floral arrangements made by yours truly(www.theacornatwisteriahill.com) , vintage books, two paraffin oil Lexington lamps(www.hazelnutneworleans.com) , and another porcelain shell. The large black clock is another Atlanta purchase (www.hillstreetwarehouse.com). 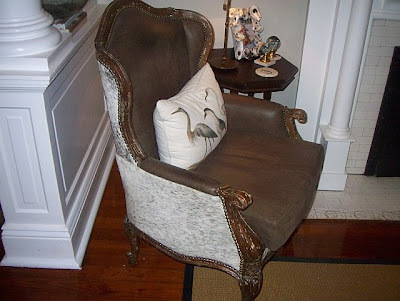 The left corner features one of my favorite chairs covered in leather and hide. It was purchased from a dealer at Scott’s Antique Market. I just cannot remember the vendor’s name to save my life. 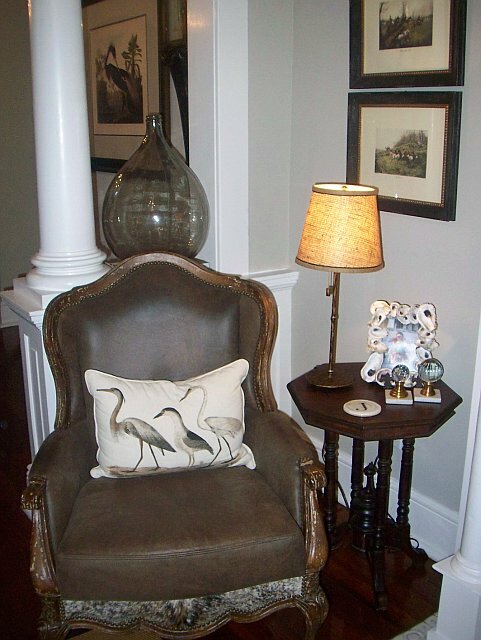 The pillow highlights my love for coastal birds. 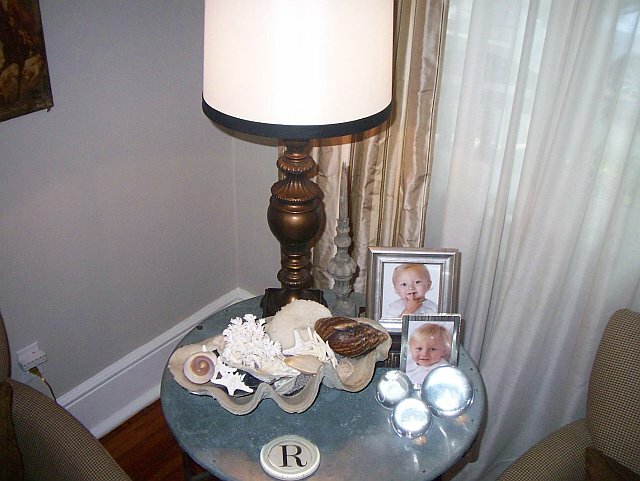 The side table features another lamp topped with an oh so trendy burlap shade, an oyster frame compliments of One Little Bird(my BFF), and two stair post crystals. The art on the walls is a collection of hunt style oils and framed prints from Tenille & Co., formerly The Plantation Shop in Atlanta. 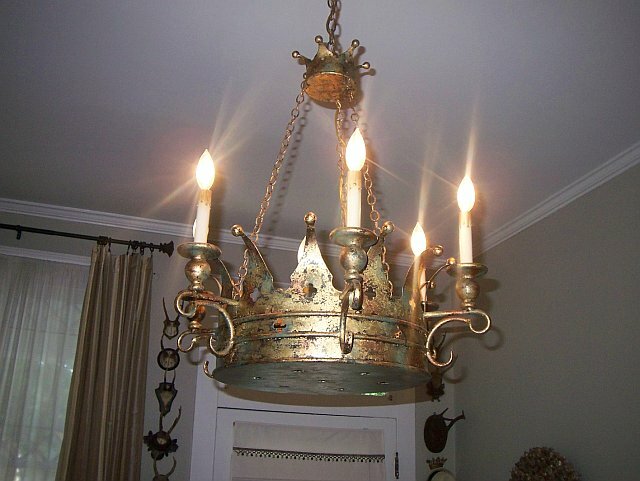 The crown chandelier is by Currey & Company purchased from Old Estate in Thibodaux. I really like the calmness of the parlor. I hope you do to. That chandelier is fabulous--thanks for the peek! Definitely lovely! I have coveted that crown chandelier for years! An absolutely gorgeous pad. Love your collections. 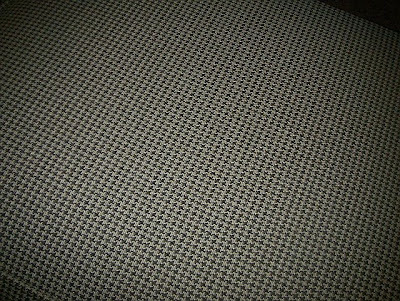 Your colour scheme is my future colour in our lounge (or living room) at D´Box. Wow, I enjoyed you decorating so much. 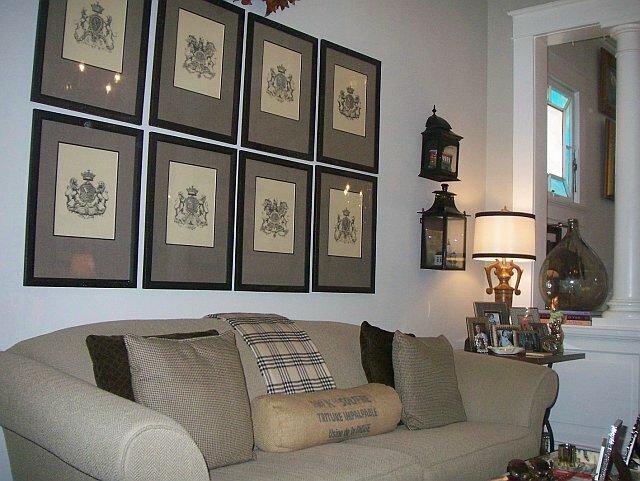 Love your sofa and the collection of pictures above it. 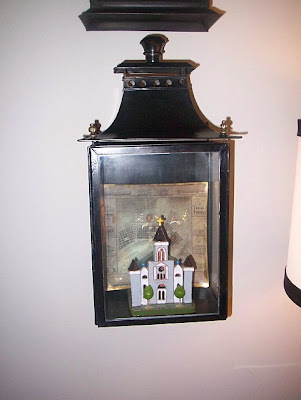 Your sconces on the wall used to house and display objects are a really cute idea! I love seeing creative uses for items like that! 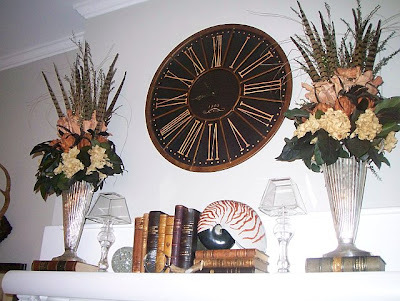 Your dried arrangements on the fireplace are perfection! I have roses from a recent anniversary gift that you've inspired me to dry and put on display in my new guest room. I love the featheres mixed in there- great touch! 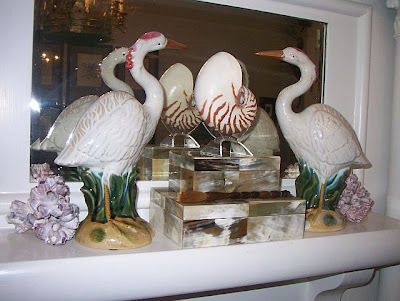 Those birds are beautiful- I love how they were created with their heads canted just right! Your crown chandelier is awesome! I like the demi-john on the niche- great look! Your overall presentation of the "parlor" area is perfect and I can see why you enjoy using it a lot! Beautiful house and decorations! 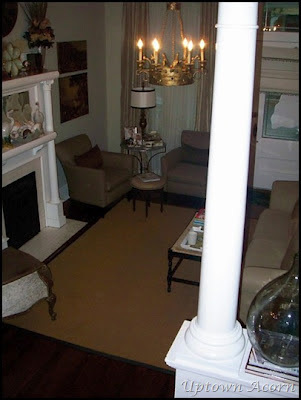 I love, love your chandy..I'm looking for one for my brakfast table, which is adjacent to my formal dining room, so your elegant chandy would be perfect! Beautiful parlor! I am your new follower, I hope you'd like to visit me and do the same. Great meeting you! Ron, great parlor. Love your antler collection. I have one, too. Looks like a great room to visit with guests in. I do need a link to the party added to your post, please. Thanks for joining. This should have been published in Bryan Batt's coffee table book....their loss!!! This room has Southern style written ALL over it. You are a master decorator! I am in LOVE!!!! I want this room. Great design. Soothing color palette. Ron, This is a gorgeous room!! There are so many of the things I love in your parlor...Beautiful. Thanks for linking to the OHP. 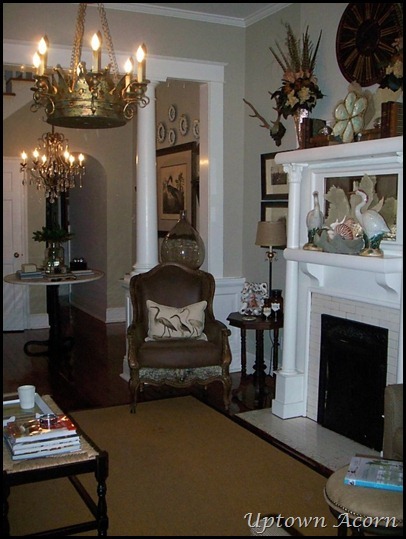 Love the antlers, crown chandy, and that amazing mantel!! Your newest follower here, would love for you to visit me at the Farmhouse porch sometime! This is gorgeous! 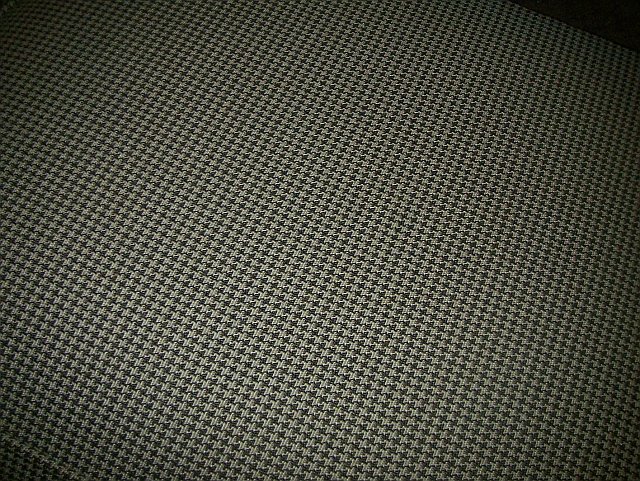 Your room is magazine ready! 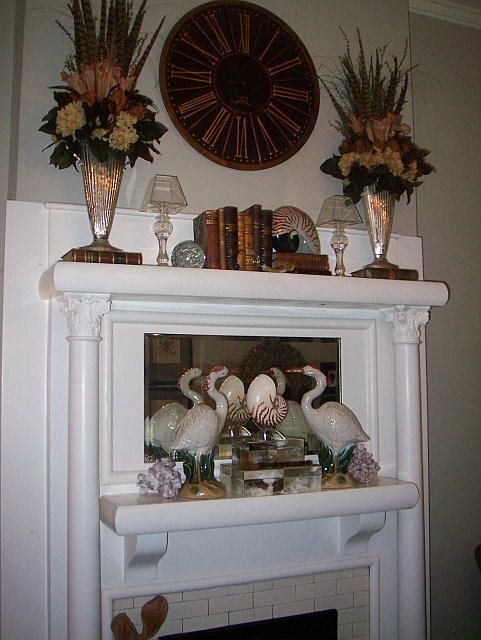 The mantel is fabulous! You're so talented! I love every inch! I am in love with everything you've done! Your mantel is amazing to look at! You have such a clear style, and I can tell you love everything you've collected! Sigh...! Just beautiful! Ever think about publishing a book??? What a wonderful tour. I absolutely love your Parlor. The chandy is so wonderful. You are lucky to be the conservator of that beautiful piece. So perfect for NO. I +1'd this post. I think that sends to my google+ page. I love your style! The crown chandelier is fabulous!!! Oh yeah, sweetie, this would be my favorite room too if it were my house...so I'm loving it from blog land and admiring all the great details it has! I'm at the Polo House's Favorite on the First too. Have a good rest of the weekend. LOVE your parlor. 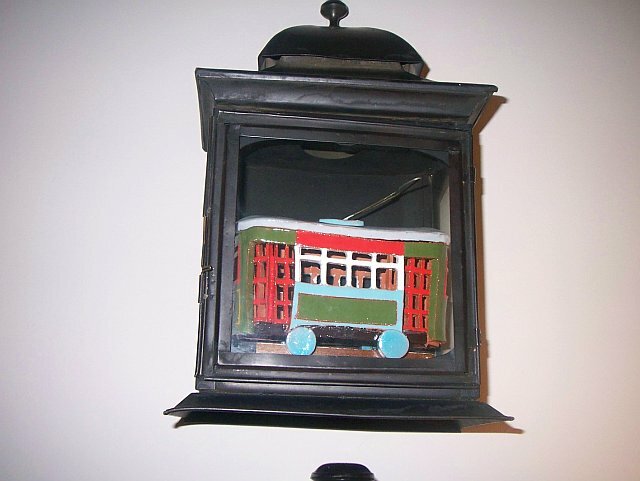 I especially like the shadowboxes with the streetcar and St. Loius Cathedral.....so cute. Do you have power yet? My MIL lives in the Garden District on 2nd St. She doesn't have power. Power is back tonight, but we are in Bay St. Louis. Thanks!!! I love Scott's Antiques! Always can find something neat there! You know I just go kooky over this room, Ron! Your accessories are over the moon! doorway and the horn boxes on the mantle, etc etc etc!!! Your floral designs up there are fab as well! You are so talented.... omg, Ron. Hello! I'm popping over from the Polo House and have so enjoyed my tour! The wall of pictures is just beautiful! The chandy is so pretty and unusual - almost looks castlely! :) You have wonderful decorating taste. Ron, to start a list of what I liked most would be, weeelll..too long! 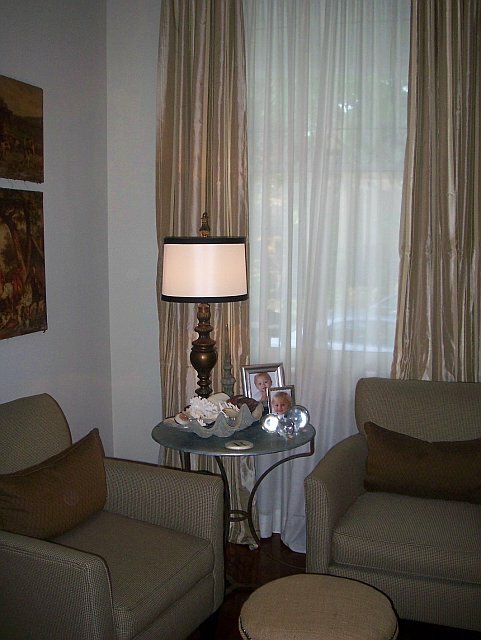 I love everything in your home!! I have a couple questions. 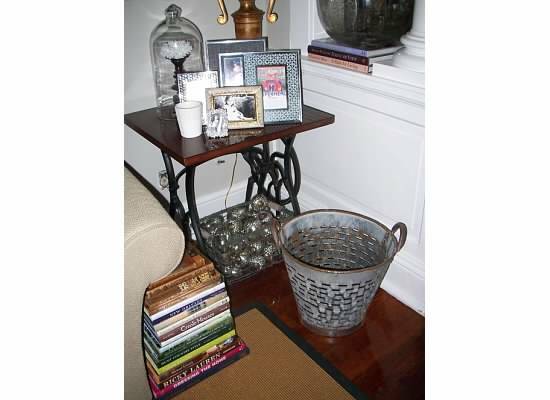 1) do you sell your arrangements (like the ones on Amanda's den mantle and your mantle) at the Hill Street location in Atlanta. Is it open for retail customers (like me)?? 2) is your clam shell concrete or resin? any suggestions on where to get one? Is yours heavy? Does it have feet (balls) on it? I know about Ballards and West Elm. Thanks! Enjoy your week with the outlaws! My arrangements are hard to ship. My clam shell is concrete, very heavy. I suggest Ballards or Z Gallerie. Thanks for the response! Concrete...yikes! LOVE, LOVED THE TOUR.Is this house in Thibodaux? You havent tried Amy's Country Candles yet? They are sought after all over the universe. God Bless.